Ecuador. Ecuador. Ecuador. Oh, how I love thee. After spending some time in Colombia and Nicaragua, I knew I had to make my way through this beautiful, earthy and mountainous country. I've been longing to travel here for a few years now, so it feels unbelievable to finally say 'I DID EET!' I didn't do it alone, though - I traveled with my lovely boyfriend Andrew, who I am so thankful for. We travel to foreign countries very well together, so I feel pretty lucky. Every place I travel, I return with tingling sparks of inspiration, interesting facts and tips about that country, and of course, the desire to travel more (and longer). I also come back with a reignited love for speaking Spanish... not that I'm great at it, but I love the challenge of getting around using the words I know and coming back with more to add to my vocabulary. Documenting my travels on my blog is one way for me to reminisce on my adventures, but I also hope you find this helpful for your future travels! My Advice: Pack light - only pack the essentials. I packed with the intention of getting as much wear out of each piece as possible with zero washing. With Athleta's high-quality fabrics, I was able to mountain bike, hike a volcano, and stop, drop and yoga freely and comfortably. The fabric was quick-drying and did not absorb odor. My natural deodorant wears off quickly, so odor is always a concern of mine... Thankfully, it was never an issue on this trip. Read my guest post "Travel Light, but Wander Far" on Athleta's Chi Blog for a more in depth look on clothing tips. Other Packing Tips: You know I'm all about being au natural, but I must make one exception. I highly recommend wearing a mosquito repellent with 30% Deet. You do not want to risk getting Zika, Chikungunya, Malaria or any other mosquito-related diseases. With that said, also bring sun screen, a hat, and more underwear than you think you'll need. Days 1-4: We spent the first four days based in Quito. Our hostel was located in the heart of the Old Town, so there was much to see. Sites to Skip: La Mitad del Mundo (Middle of the World) Tour. I personally found this to be a tourist trap. There are a few different "Middle of the World" spots, so I'm still not quite sure if we saw the 'real' one. The location changed once a GPS was created, and they realized they were a bit off...kind of a funny story. The museum guide was very knowledgeable and sweet, and she gave a great history lesson on the different indigenous tribes and customs. I found this topic very interesting, but I would have skipped it given I was crunched for time being in Ecuador for only a week. 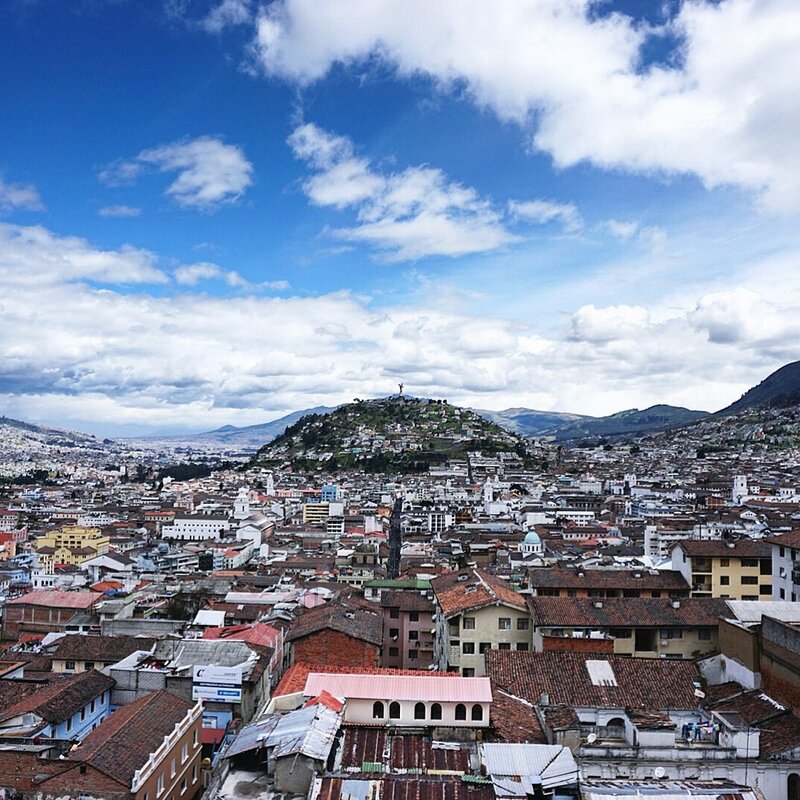 Quito in a nutshell: Quito is a beautiful city, and it's HUGE. Everything is fairly spread out, and it very much operates like a big, bustlin' city. Be careful at night. I would take a cab if you plan on going out after dark. Days 5-8: For the second half of our trip, we took a 3.5 hour bus ride to Baños de Agua Santa. This town is known for its incredible waterfalls, adventure sports and charming little town. Generally, Baños was a lot safer than Quito. I felt more relaxed about whipping out my iPhone or camera to take a photo, since there were a lot of tourists around doing the same. Sites to Visit: Spa Day at El Refugio, Breakfast & Coffee at Arte Cafe & Té, Water Canyoning (see photo below) through Geo Tours, Mountain Biking, Hot Springs, Lunch at Cafe Hood (get the quinoa soup! ), and be sure to hit up the shops in town for beautiful sandals, jewelry, and handbags. Sites to Skip: Don't waste your time renting an RTV - go straight for the mountain bikes! Baños in a Nutshell: Definitely visit this town if you love adventure sports. It's a unique experience with the most incredible backdrop. I never thought I'd go canyoning, and I felt like a complete badass afterwards. The water was freezing and I thought I was going to die during the first waterfall, but hey, I'm here and I'd totally do it again. Community Hostel: While in Quito, we stayed at an awesome place called Community Hostel. It was $30 total per night for a private room shared with my boyfriend. Breakfast was $3 and dinner was $5. Dinner was family style, so this was when we met other foreigners. It was so cool meeting people from all over the world, and hearing about their adventures. Many of them had been backpacking for 6 months or longer. Quite inspiring to say the least! Definitely, definitely stay here if you're in Quito. If you're a solo traveler, it's the perfect place to make friends. Princesa Maria Hostel: ...then we discovered Princesa Maria Hostel. It was beautiful, clean, spacious, and the owner was so sweet. It was a bit of a walk from the center of town, but it was definitely worth it. The cost was $30 total per night for a private room. I definitely recommend it if you're in Baños. Bring plenty of $5s and $1s rather than larger bills - Ecuador's official currency is the USD, so no need to exchange money. Carry hand sanitizer and tissue paper for the public restrooms. Trust me. Wear Flatform Tevas - No joke. These elevated sandals saved me from stubbing my toe on the uneven roads. I tripped quite a bit, and had I been wearing flat sandals, I would've surely lost my toe nail. Or you can just wear closed toe shoes, but I personally love my Tevas. Don't spend all of your cash at markets. I learned the hard way, hah. Will you want to eat like you're on vacation? Do you want to stay in a hostel with hot water and wifi? Buying gifts for family and friends? Are you participating in tours and other tourist activities? Welp, I hope this information is useful to you! Please feel free to email me. I am more than happy to answer any specific questions you might have about Ecuador, Nicaragua, Colombia, or traveling to Central and South America. Sending lots of love, light and good vibes your way! The Essentials: What's In My Yoga Bag?